Muffler & Exhaust Services | Metro Transmission Inc. Whether it’s a simple exhaust repair to meet state emissions requirements, or a complete exhaust system replacement, Metro Transmission Inc. has the experience to deliver the muffler repair and exhaust services you need. Our full-service repair shop and certified technicians have over 100 years of combined experience and will guide you down the entire process, from start to finish. Emissions (Smog test fail): Did you recently fail a CA smog test? Not sure what to do next? The experts at Metro Transmission Inc. know exactly where to start and how to get you the passing grade you need. We will use computer diagnostics (from your test, and our computers as well) to determine the cause of the failed test, and the solution to fix it! Muffler Replacement: Is you muffler a little louder than usual? Or is it idling a little rougher than normal? It may be time for a replacement muffler. 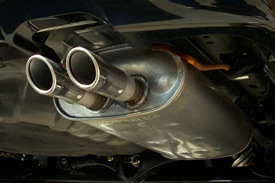 Our certified technicians will ensure we install a muffler that meets California, EPA, and CARB requirements. Sensor (O2) Replacement: From time to time the sensors that communicate within your exhaust system fail and need to be replaced. Metro Transmission Inc. is experienced in diagnosing and replacing any sensors related to your exhaust and muffler system. Catalytic Converter: The catalytic converter is one of the most important elements in your exhaust system, especially in North County San Diego. The catalytic converter is designed to reduce emissions, noise, and help keep your exhaust system cooler. When this component starts to wear down, the amount of pollution your vehicle lets out into the air can be greatly increased. No matter what your muffler & exhaust service needs may be, Metro Transmission Inc. has the right solution for your vehicle. Our certified technicians will assist you in making the best decision for your vehicle, and our professional installation process will ensure you get the most from our muffler & exhaust services.